Interested in reading fascinating stories from the history of Riverside? Visit the Scout! Riverside Cemetery, founded in 1876, is Denver’s oldest operating cemetery and is designated as a national historic district. Located just two miles north of downtown in the center of an industrial area, Riverside is truly a unique cultural treasure that has been widely ignored for many years. Founded in 1876, the same year Colorado gained Statehood to the Union, and the same year the nation held its Centennial Celebration, Riverside Cemetery has the distinction of being one of the first park-like, rural cemeteries in the Rocky Mountain West. Riverside Cemetery is the longest continually operating cemetery in Denver, and one of the most significant historical resources in Colorado. Noting the importance of the 77-acre site, the cemetery was designated a National Historic District in 1992. Now surrounded by the gritscape of a disparate industrial district, partly in the City and County of Denver and partly in Adams County, the cemetery is in a state of rapid decline. Many of Colorado’s most famous pioneers found their final resting place at Riverside, including Augusta Tabor, Barney and Julia Ford, Silas Soule, three territorial governors – John Evans, Samuel Elbert, and John Routt – and numerous mayors, entrepreneurs, and civic figures. A wide range of cultures are represented at Riverside, including Russian Orthodox, Korean, Japanese, Chinese, Italian, and African American. Riverside also hosts an official military cemetery, and is the permanent home of over 1,000 veterans from the civil war through the first gulf war. Three civil war Medal of Honor recipients are among those buried in the military cemetery. Riverside is a document of 130 years of Colorado history, both above and under the ground. The threats currently facing the cemetery are significant and compounding. The most significant issue it currently faces is the loss in 2001 of its “handshake agreement” to water rights from the South Platte River. The historic landscape has suffered a staggering loss of plantings without supplemental irrigation to augment the low natural precipitation of the region. Turfgrass is all but gone from the property, leaving only weeds and patches of native grass as the primary groundcover. In addition, a large percentage of the Riverside’s formerly extensive canopy of shade and evergreen trees has died from the resulting drought conditions. Over the fall and winter of 2008-2009, several dead trees fell and damaged nearby monuments and a historic private mausoleum. Many more were taken down to manage this risk, but additional trees are in danger of falling during future storms or periods of strong winds. Future collapses could possibly do additional damage to Riverside’s extensive collection of artful stone markers and irreplaceable white bronze monuments. Revitalization of Riverside will require a combination of respect, commitment, and creativity. The cemetery’s location along the South Platte River’s rich natural areas offer unique recreational opportunities, while its vast cultural and artistic treasures, if preserved and enhanced, could substantiate a valuable historic park resource. In addition, with a new vision for a more regionally sustainable cemetery, adequate space still exists within the grounds to permit additional burials well into the future, which would allow Riverside to once again serve the community as an active, operating cemetery and vital community resource. Community interest needs to be generated, cooperative support marshaled, and innovative solutions identified to help stem the decay and return the condition of the cemetery to one of renewed respect for the families interred within. Without the concern and help from the greater community, and focused assistance from a coalition of public and private groups and individuals, the condition of the Riverside may well continue its unfortunate decline and keep at risk the significant memorial art and genealogic history it contains. The imagery above the ground at Riverside is every bit as compelling as the history under the ground. 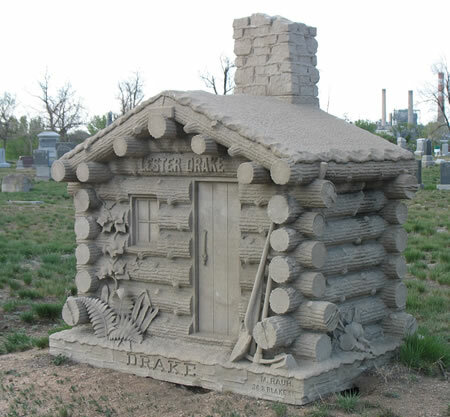 For instance, the Drake Cabin (pictured below) is the limestone monument to Blackhawk Pioneer Lester Drake. Riverside Cemetery is located just a half mile north of I-70 at 5201 Brighton Boulevard. You can find more information on our visit Riverside page. If you have a story, image, or comment you’d like to share about Riverside, visit the The Riverside Scout, where you can find stories, art, and history of Denver’s oldest cemetery. This site is open to submissions from anyone, including historians, planners, families, and community organizers. History Mystery Tours Coming Up! Public Hearing – RIVERSIDE NEEDS YOU!